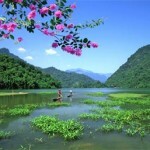 The North East mountainous areas of Ba Be Lake, Cao Bang offer breathtaking views and interesting subcultures. It is the least travelled area of the North and attracts hardier travellers craving a glimpse of some of the more remote ethnic minority people. AM: 07.30am – Departing Hanoi for a drive through the Red River Delta North along Highway 3 to Thai Nguyen. Of interest here is the Museum of the Cultures of Viet Nam’s Ethnic Groups. PM: Leaving the delta behind, you’ll start climbing into the mountainous area of Ba Be National Park. Dinner and homestay in a local house. AM: Have breakfast with your Tay hosts before exploring the lake with lush forest clinging to the surrounding limestone mountains. Reach the end of the lake and trek to Dau Dang Waterfall. PM: Heading North through the mountains to the city of Cao Bang. Overnight in a hotel in Cao Bang. AM: After breakfast, consider climbing the hill up to the War Memorial for a great panoramic view. Take a scenic day trip North of Cao Bang to the beautiful Ban Gioc Waterfall on the Chinese border for a picnic lunch. This picturesque, cascading waterfall is 53 meters high and has an impressive span of 300 meters. The unique landscape includes limestone karst formations soaring from the verdant rice paddies of Tay, H’Mong and Dzao ethnic minority groups. PM: On the way back to That Khe (Lang Son) explore the expansive 2,144 meter Nguom Ngao Cavern to discover its brilliant stalactites. Overnight at a guesthouse in That Khe.